Training out of RVT Rizzo and TFT, nderson “Braddock” Silva, 32, of São Paulo, Brazil was one of the winners at “ONE: Roots of Honor.” It was his first bout and first win in ONE Championship’s striking-only league ONE Super Series. 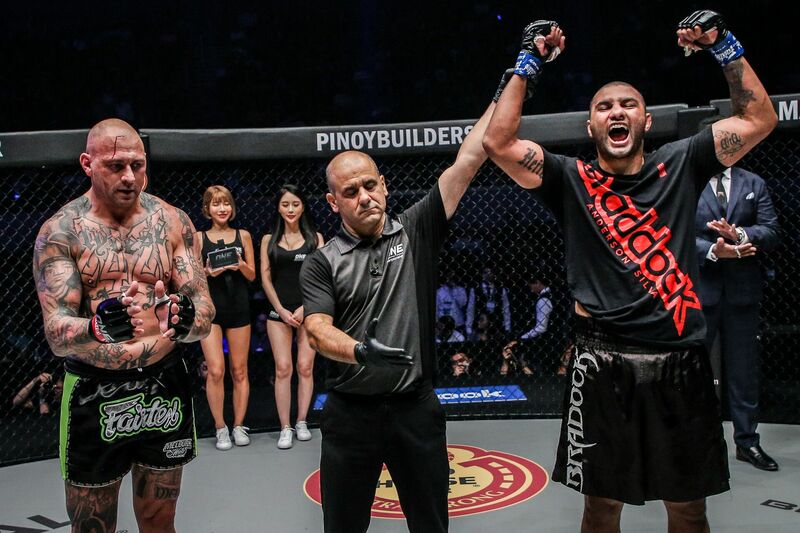 Featuring two kickboxing contests, two Muay Thai bouts and 11 mixed martial arts matches, “ONE: Roots of Honor” took place at the SM Mall of Asia Arena in Pasay City, Metro Manila, Philippines on April 12, 2019. In the eighth bout of the evening, Silva faced Andre “The Giant” Meunier, 42, of Melbourne, Victoria, Australia in a kickboxing contest in the heavyweight division with Elias Dolaptsis as the referee. A Brazilian kickboxing World Champion, Silva announced his arrival to the global stage of ONE Championship by overpowering Meunier. The hard-hitting heavyweights wasted no time in providing fireworks as they traded massive combinations right off the bat. Midway through the opening round, Silva connected on a counter-right hook that knocked Meunier out cold instantly. Dolaptsis put a stop to the heavyweight bout after 1 minute and 14 seconds in the first round when the Brazilian kickboxer knocked out his Australian opponent. Born in São Paulo on August 29, 1986, Silva previously competed in SUPERKOMBAT and GLORY. His fight name is from Chuck Norris’s character in the 1984 action film “Missing in Action” named Colonel James Braddock. Including Australia and Brazil, 18 countries were represented at “ONE: Roots of Honor.” The other countries were Afghanistan, China, Cuba, Indonesia, Japan, Mongolia, Morocco, the Netherlands, the Philippines, Romania, Serbia, Singapore, South Korea, Thailand, Vietnam and the United States. Check more photos from Meunier and Silva’s bout at “ONE: Roots of Honor” on Top Sports Asia.